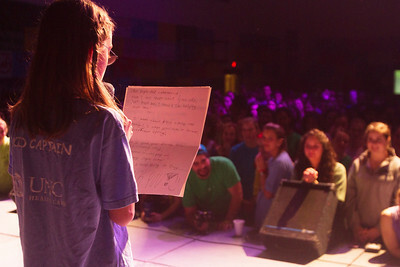 Jamie Tworkowski, the founder of "To Write Love On Her Arms," came to speak at a Carolina Union Activities Board event. Josh Moore, a musician from Carrboro, opened for him with a few songs. Tworkowski spoke about the stories that helped develop his organization and answered questions from UNC students. Mary Karr. 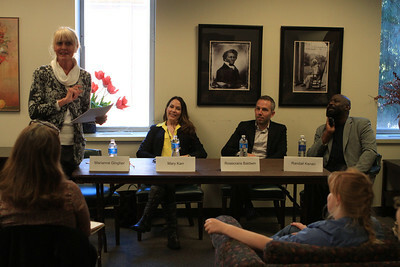 the Distinguished Writer-in-Residence for the English and Comparative Literature department, spoke at a panel about memoir writing on Wednesday February 27, 2013 in the Donovan Lounge in Greenlaw. She was joined by three other distinguished UNC professors who are also memoirists: Randall Kenan, Rosecrans Baldwin and Marianne Gingher. 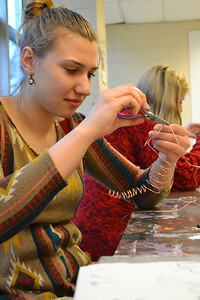 Anna Balta participates in a Wire Sculpting class that is a part of the Art a la Carte classes offered at Ackland. First the class discussed the "More Love" installation piece in the museum. Then they practiced sculpting their names and 3D figures with different types of wire. 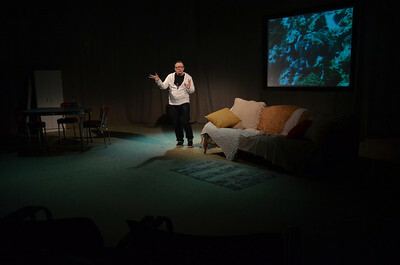 Cast of "Why Should I Move?" 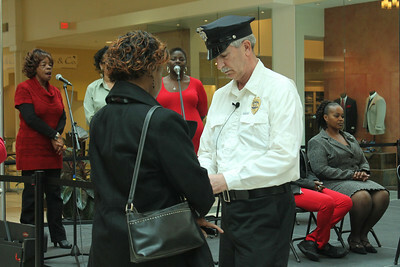 a tribute to Rosa Parks performed by members of the Chapel Hill Transit waits off stage before the performance. Sheila Neville, Young Rosa, gets arrested by Jim Harder who played the police officer. 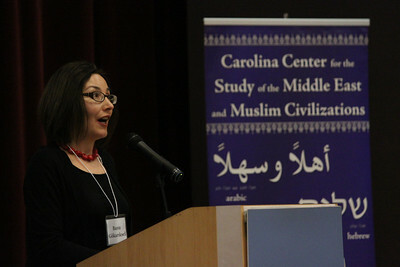 Dr. Banu Gökarıksel presents at the ReOrienting the Veil conference that took place February 22-23rd in the FedEx Global Center. Preview for Company Carolina’s new show opening Friday. 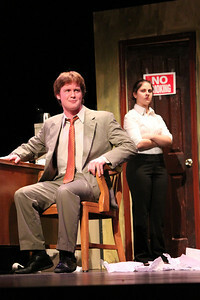 Enter the deceptive world of business in the Pulitzer Prize winning play Glengarry Glen Ross. Mamet dissects the American Dream as four Chicago real estate agents prepare to do anything to close a sale, be it bribery, burglary, or preying on unwitting buyers. But is success worth sacrificing one’s morals for? Well, sometimes you have to lie a little if you want to keep your job. 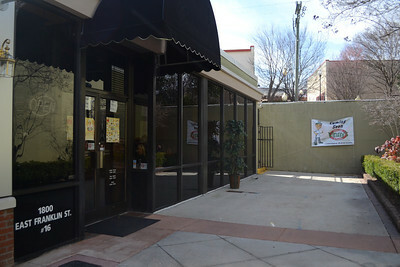 Vinny's Italian Grill and Pizzeria will be opening soon in the Eastgate shopping center. 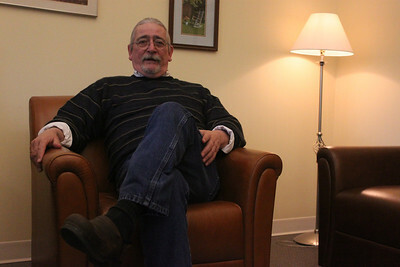 Director of Accessibility Resources and Services Jim Kessler will be retiring effective April 1st after 30 years of service to UNC. 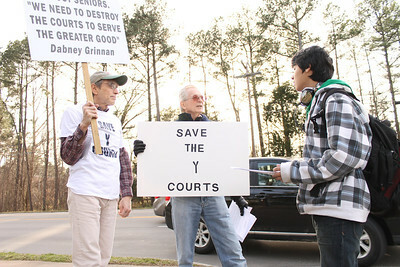 John Pinkerton (left) of Chapel Hill and John Greifenberger (middle), a Chapel Hill racquetball player of 35 years, protest the destruction of the Chapel Hill YMCA's racquetball/handball courts by informing Azamat Ahmedjanov, 16 from Chapel Hill. 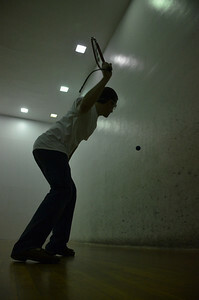 "The board seems to be discriminating against seniors who play racquetball and handball players," argued Greifenberger. He and his fellow protestors enjoy playing racquetball with each other and "they're trying to take it away," said Pinkerton. Dr. Michelle Droke (left), a veterinarian at Cole Park Veterinary Hospital, gives Flashpoint Henry Percy a checkup with the help of Serena Kerney (right). 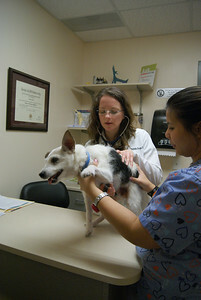 Dr. Droke graduated with a degree in veterinary medicine from Texas A & M in 2000. 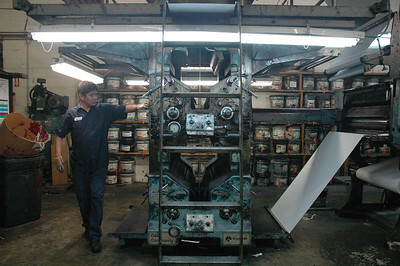 She has been with Cole Park for 11 years. 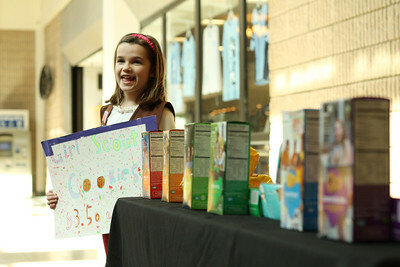 Homeschool Girl Scout Troop 1152 sells the newly-named cookies at University Mall. 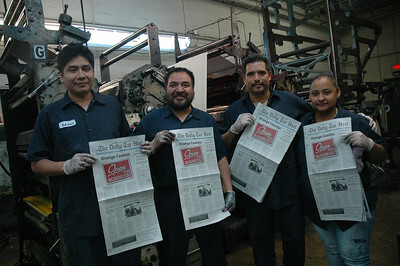 Their most memorable sale occurred when a gentleman asked about the largest tip they had received, which was $20. He proceeded to buy two boxes, pay with a one hundred dollar bill, and said, "Now this is your biggest tip." The girls said that sales have been about the same or maybe better than they were last year. Olivia Kerns, 8 of Durham, holds a sign saying, "Girl Scout Cookies $3.50" as advertisement for the cookies she is helping her troop sell. 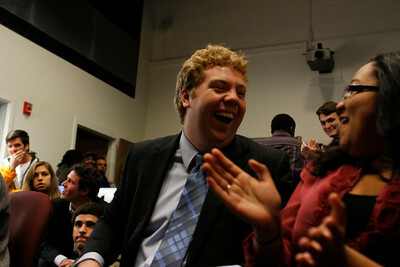 Christy Lambden reacts after hearing that he has won the the SBP elections. He won with 55% of the vote. Sophomores Mike hermanson and Jon Gaegler play racquetball in the SRC on Tuesday afternoon. 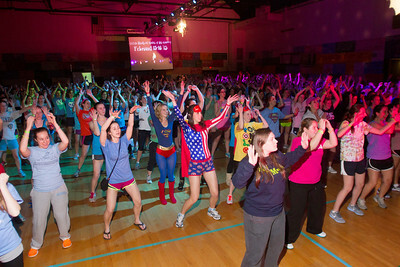 "It's a great way to stay active and have fun," said Hermanson. 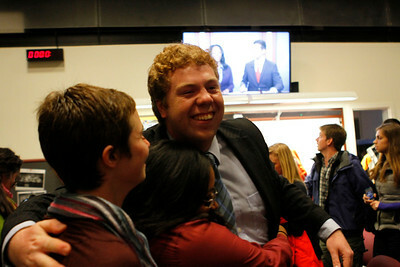 Students campaigning for Will Lindsey and Christy Lambden in the pit . 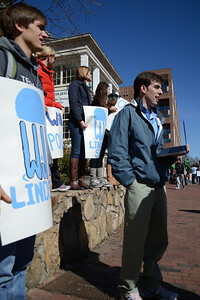 Andrew Wood holds a sign for Lindsey campaign. Nathan Jeffay, VP of Epsilon Eta Environmental Honors Fraternity demonstrates the ELF velomobile on campus. The ELF velomobile is a solar and pedal powered vehicle designed to fill the niche between a bike and a car. 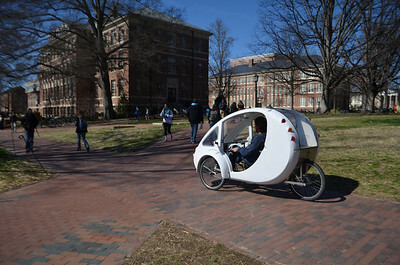 The project of Organic Transit in Durham, NC, was successfully funded by Kickstarter backers on January 13th. Street legal in all 50 states, the ELF can reach speeds of 20 mph with the solar powered motor, and even faster speeds when used in conjunction with the pedals. 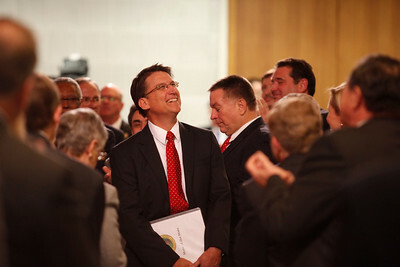 Govnah Pat McCrory gives his State of the State address. 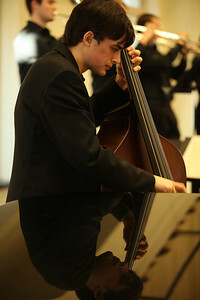 Chris Wright, a bass player for the UNC Jazz Band, contributes rhythm to the piece "Chi Chi" during the 9th Annual Valentine's Jazz Concert on Sunday, Feb. 17, 2013 . 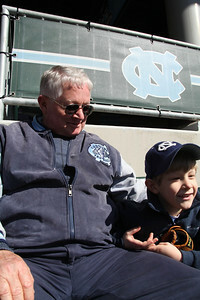 Carson West, 5, watches the UNC baseball game Sunday with his grandfather Eddie West. Eddie, a long-time Carolina baseball fan, comes to almost all of the games and always brings one of his grandchildren with him. The 13th Annual Revolutionary War Day will be Saturday-- commemorating British General Cornwallis’s week-long occupation of Hillsborough in February 1781. All activities take place on the grounds of the Alexander Dickson House. 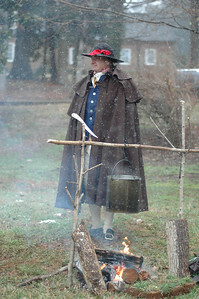 Todd Dickson stands in full authentic uniform outside of the Alexander Dickson House. 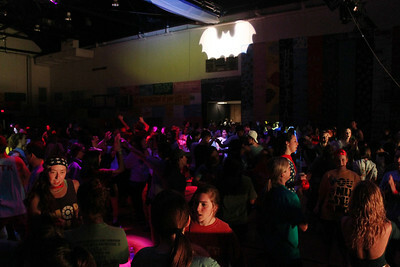 Dancers danced all night in Fetzer gym under the Batman light for 24 hours. 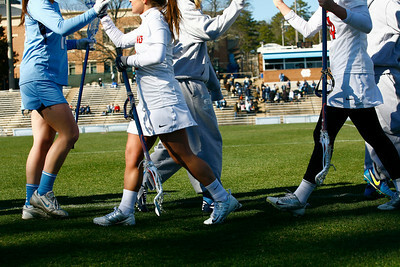 From left. 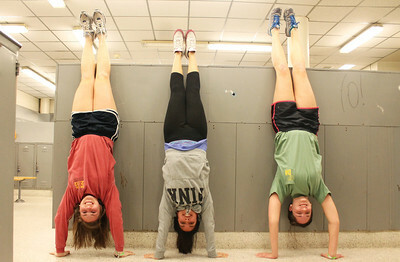 Lauren Hamlett, Hilda Tajalli, and Andrea Lambert find temporary relief for their feet by doing hand stands. 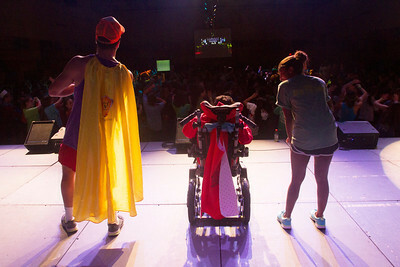 UNC Dance Marathon! Carrie Smith (left), 10, a Kid Co-Caption of team 11 and her friend Evie Freel (right), 10, were hanging out and coloring at the marathon before joining the dance party. 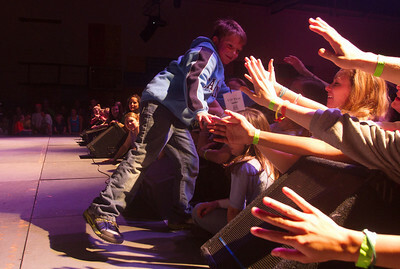 "It's the best dance party we've ever been to," Carrie said. 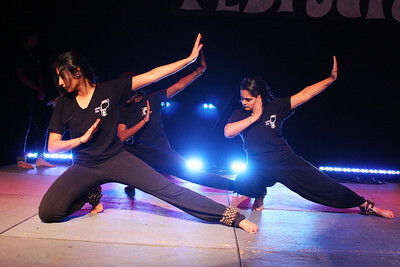 The Triangle Dance Festival for AIDS presents: an evening of the triangle’s BEST in performing arts to benefit HIV initiatives locally and globally. Hosted by Baba Chuck Davis of the Chuck Davis African American Dance Ensemble, and featuring professional performing arts groups along with top student performers in dance, music and spoken word. 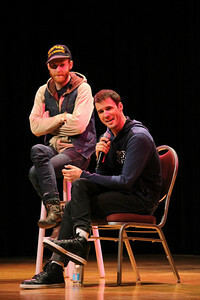 Took place on Friday night in Memorial Hall. 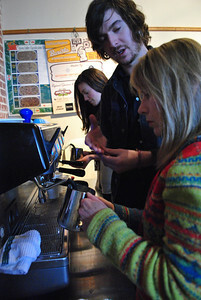 Adrial Dale and Kaitlin Houlditch-Fair perform. The Triangle Dance Festival for AIDS presents: an evening of the triangle’s BEST in performing arts to benefit HIV initiatives locally and globally. Hosted by Baba Chuck Davis of the Chuck Davis African American Dance Ensemble, and featuring professional performing arts groups along with top student performers in dance, music and spoken word. 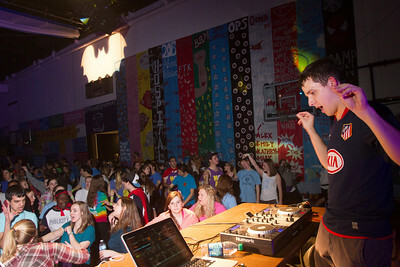 Took place on Friday night in Memorial Hall. 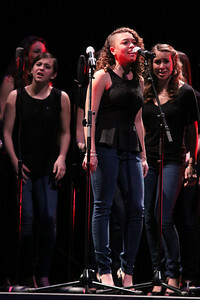 Cadence performs. 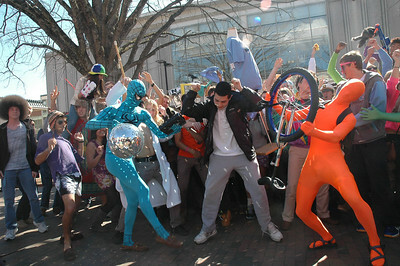 UNC attempts to host the largest Harlem Shake. 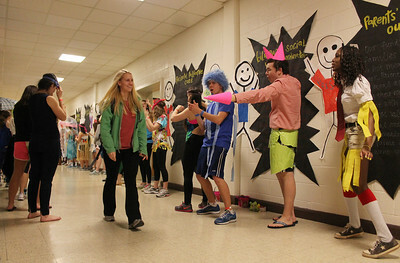 Motivators dressed up for the theme, "Under the Sea," for the first shift of dancing. 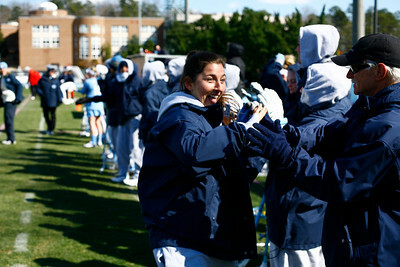 They greeted dancers as they walked into the marathon. 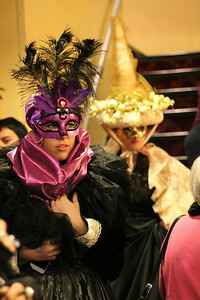 A press conference was held at the Old Well on Thursday the 14th. 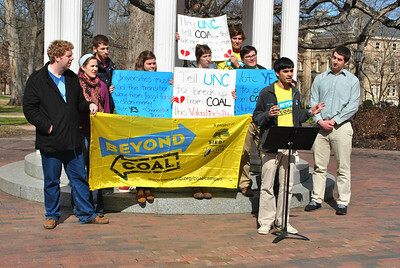 The group used this conference to speak out about pushing for coal divestment at UNC. Sam Peterson recounts his life journey as he explores gender relationships in the natural world. 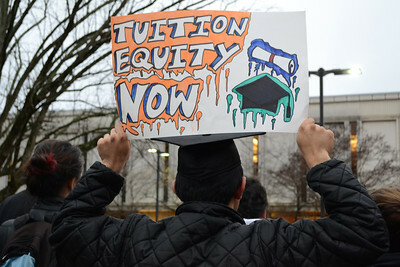 An Undocumented Youth Rally was held in the pit. Marco Cervantes participates in the event. 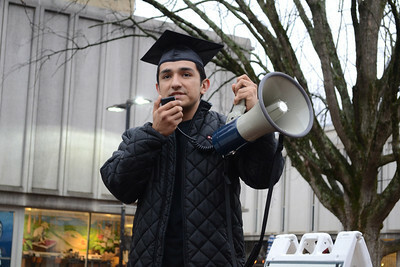 An Undocumented Youth Rally was held in the pit. Marco Cervantes speaks at the event. 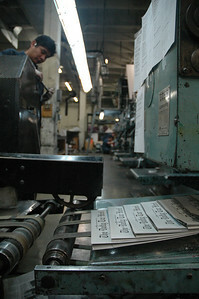 Internationalist Books hosts a monthly program where customers come to write letters to political prisoners. 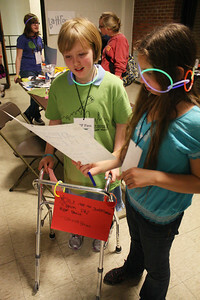 Emily Rowan, 11, of Carrboro attended the event's third-year anniversary. 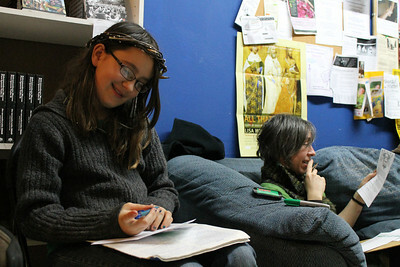 She, Maria Rowan (her mother, right), and their peers at Internationalist Books wrote birthday cards to select prisoners.